Starting a tile installation company or perhaps doing tile installation projects for a while? You must know that these projects are tricky and you will only be successful if you have the right tools during the tile installation. We have asked the experts and leading companies of tile installation products, about the right tools to complete these installations, and they have provided feedback on the favorite tools used by tile installers. Make sure you check all these items off your personal list. A manual cutter is one of those tools you always need to have. Easy to carry, use and for almost any type of job, the manual cutter are used for straight or diagonal cuts. Look for cutters with additional guides that offer enhance visibility when scoring and cutting. This is the right tile tool when working with glass mosaics or tile because it will not affect the quality of the glass surface and generates a clean sharp cut. Remember you can always go high tech with one of the best tile saws available in the market, an electric saw. Making holes and drilling tiles require precision and high-quality tools. Drill bits are a very important tile installation tool allowing you the accurate drilling process. Rubi Tools offers some great drill bits, manufactured with lateral openings, that improves the cooling of the drill bit. These openings also help on removing drilling residues after each drilling. Remember that most drill bits will last only 20-25 holes, so keep that in mind if your bit is not working properly. This is one of my favorites. The tile installation tool kit has all the necessary small tools a tile installer needs. Starting with tile strips, designed to guarantee the grout joint width and that are used in conjunction with quick caps that distribute the tile weight. The cap eliminates the time spent on checking that the tiles installation is all at the same height and leveled. 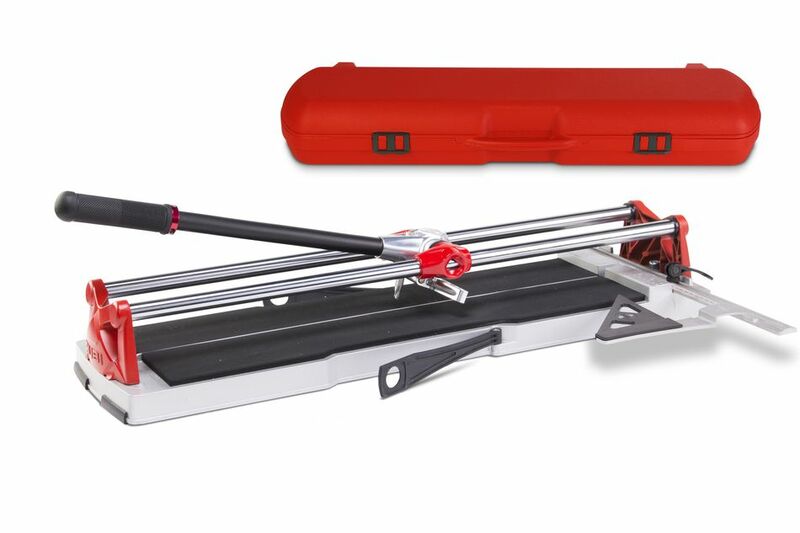 Tile nippers are also part of the kit helping you distribute and level the weight of the tile. Rubi tools offers a very nice leveling kit. Use rubber buckets to mix your mortar. Rubber buckets are easier to clean than pails, stackable and easy to carry. These buckets, although not necessarily only as a tile installation tool, are used to mix cement, carry materials and store minor stuff for tomorrow's work. Buckets are available in multiple sizes and volumes. A good mortar mix is only as good as the mortar mixer can be. Attached with different types of paddles, mortar mixers are available in a variety of speeds and motors. Mortar mixers work great when mixing cement adhesives, resins, paints and other materials. The importance of having a reliable mortar mixer is that it will reduce the air entrapped in the mortar to increase their strength. Make sure to verify that the adequate paddle is used in accordance with the amount of mix used. Trowels and notched trowels are among the tools that not only tile installers carry, but tools that are useful for other contractors as well. When choosing a trowel, make sure you are choosing the right material for the tile installation process. Trowels are made out of aluminum or stainless steel and some are equipped with heavy duty handles, and make sure you understand the requirements of how high the ridges if the thin set needs to be. A lightweight yet sturdy, trowel facilitate the mortar mix application process and you can have better production rates. Make sure your trowel design allows you to hang it on the edge of the rubber bucket for faster access. Trowels have different shapes (square-notched and the U-notched) and designs allowing you to choose the right tool for the right installation. There are several sizes of trowels like 1/2, 3/8", 1/4 inch or any other size available in the market. Grout floats are needed to obtain the best results when finishing grout joints. Solid floats should be able to endure multiple uses and installations without decaying. The softer the texture of the float, the better for natural stone and/or textured tiles. Some floats act like a squeegee that can remove excess grout from the top of the tile surface. There are some designs recommended only for hard to reach areas and some other industrial type models, allowing you to spread sanded or unsanded grout over larger areas easily. It is critical to maintaining a straight and uniform joint. Tile spacers can help you on obtaining the right spacing in between tiles and even transitioning into other tile patterns or areas on which the spacing is different. You can obtain regular spacers, T-spacers and wedges allowing for a faster tile installation. One nice product available is the TWINFLEX tile spacers from Rubi Tools. It includes two sizes in the same model (1/16” to 1/8 in. and 3/32 to 3/16 in.) that are adapted to different functions; crosshead, T and lineal separator. They are reusable and allow work at two different levels at the same time. By doing this, tile installation contractors can move the linearity of their installation from one level to another, either horizontally or vertically. The list can go on, but these few items are amongst the most important tools that a tile installer needs. There are many materials, products and shapes out there for you to use, so make sure to understand the type of installation you are completing before choosing these tools.